The following sections provides a brief overview into the three green concepts aimed to be tested in the framework of ATAEGINA project. Each green function addresses a different phase of the flight: departure, cruise and approach. MCDPs are operations based on the Noise Abatement Departure Procedures (NADP) with the difference that, apart from providing noise reduction on the airport surrounding areas, it intends to reduce aircraft fuel consumption and emissions. Then, the MCDP concept consists in an optimised NADP intended to comply with currently published procedures while providing flexibility to the airline to optimise fuel consumption and emissions, and/or noise for each mission. Acceleration Altitude: This corresponds to the altitude at which the aircraft shall start accelerating until reaching Eco Speed. Eco Speed: This corresponds to the speed that the aircraft shall maintain until the End Procedure Altitude. Thrust Reduction Altitude: This corresponds to the altitude at which the aircraft shall perform the Throttle Lever Angle configuration change from 'Take Off' thrust to 'Climb' thrust. End of Procedure Altitude: This corresponds to the altitude at which the MCDP procedure finishes. The role of each parameters can be further appreciated in the following figure. The ECO STEP concept is an optimized multi-step procedure, used mainly for extended range cruise, the objective of which is the computation of an optimized cruise profile (in pre-flight and during flight) which aims at minimizing fuel consumption and/or flight time. The optimized trajectory is controlled through altitude changes (flight level) using the on board knowledge of the weather forecast and aircraft configuration along the envisioned trajectory. ECO Cruise as strategic “multi step profile” computation in pre-flight: During the flight planning, a first computation of the whole optimized cruise profile will be developed with the weather forecast and the predicted mission data. These first parameters computed for the ECO STEP will be the ones submitted in the flight plan. ECO Cruise as tactical “multi steps profile” computation during flight: The ECO STEP function will allow to update and modify the optimized profile computed during the flight planning phase and to adapt the optimum steps with the weather update and the refreshed aircraft state data while performing the cruise phase. ECO Cruise as tactical “step adjustment”: A tactical adjustment in the next step can be performed taking into account the last weather update and/or the aircraft state. This Eco Cruise principle will deliver the updated and final step in order to optimize the whole procedure and achieve the maximum benefits in fuel consumption and/or flight time. A-IGS is a class of approach operations focused in the use of glide slope angles higher than 3° (which is the nominal glide slope nowadays). This type of procedure is computed dynamically on board, taking into account not only the actual aircraft configuration, but the environmental conditions, to ease flare into a fixed rate of descent. 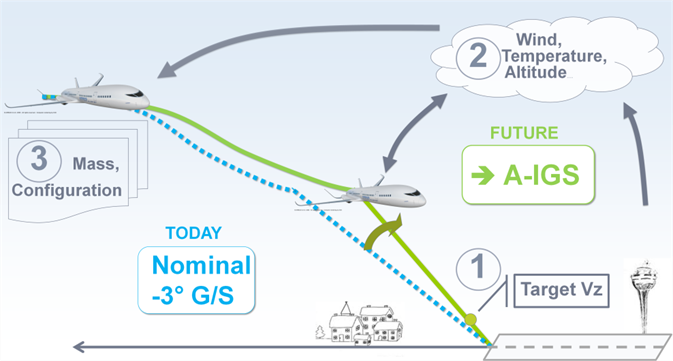 Then, the A-IGS concept consists in an adaptive steeper approach intended to take advantage of the knowledge of the flight actual conditions (environment and aircraft) providing flexibility to the airline to optimise emissions and/or noise for each mission.